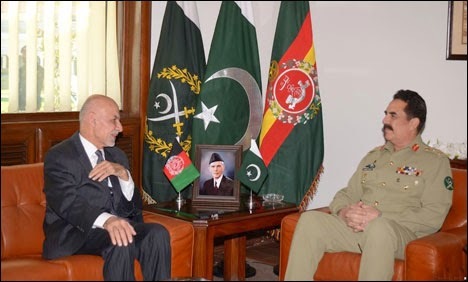 After destructive bombings in both the countries, Afghan President Mohammad Ashraf Ghani has met a visiting Pakistani delegation led by Chief of Army Staff General Raheel Sharif at Afghan Presidential Palace, on Wednesday. "The delegation reconfirmed Pakistan's commitment to helping bring peace to Afghanistan. The reported progress and the messages were positive, reflecting the commitment of Pakistan. The results of these efforts will become clearer in the near future," the palace said in a statement. COAS General Raheel Sharif had also met with Afghan senior military and political leaders in Kabul. "The government of Afghanistan expects that bilateral cooperation between Afghanistan and Pakistan will ensure lasting peace in both countries," said the statement. Both sides appreciated improving relations between Pakistan and Afghanistan and pledged to continue operations on respective side of both the countries. Pakistani Director General of Inter-Services Intelligence Lt. Gen. Rizwan Akhtar was accompanying the army chief.